The Cartulary Of Reading Abbey was discovered by a bricklayer in 1792, in a cavity in a wall at a house in Shinfield, just outside Reading. It was probably hidden for safekeeping during the Reformation, when a secretly Catholic family lived there. 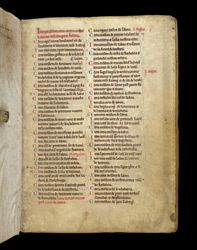 The first leaf of the manuscript contains a list of contents, which allows someone to find particular documents quickly and easily: the heading states: Here begins a summary of the charters which are in Reading church. The first entry is 'a charter of King Henry, our founder, concerning the foundation and liberties of Reading church'.